Seasonal Occurrence: Common throughout the year. Permanent resident. Profile by Vicki Stittleburg: House Finches are small-bodied finches with fairly large beaks and somewhat long, flat heads. They have streaked brown upperparts, whitish underparts with brown streaks, and 2 pale wing bars. Males have red (sometimes orange or yellow) on the forehead, throat, breast and rump. Females resemble males but without the red (or orange or yellow) areas. Originally native to the western United States and Mexico, the House Finch was taken to eastern cities for the cage bird trade and sold as the "Hollywood Finch". In 1940, a small population was released on Long Island and their progeny spread across the eastern U.S. By the end of the century, House Finch populations had exploded across the country. House Finches can be found all over Texas; they are commonly seen in cities and suburbs, but can be also be observed in rural areas dominated by agriculture or ranching. 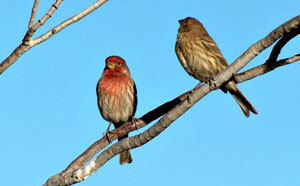 Gregarious and social, House Finches normally perch together in trees and bushes. They eat seeds, buds, and fruits and will readily visit feeders for black oil sunflower seeds. Listen for the long, bubbling cheery songs of House Finches in your neighborhood. Extensive information about House Finches.